Institutional Review Blog: Research Ethics--Now with Academic Freedom? Research Ethics--Now with Academic Freedom? Canada's Panel on Research Ethics has released a new (December 2009) draft of the Second Editon of the Tri-Council Policy Statement (TCPS). It is accepting comments until March 1. Below are mine. Thank you for the opportunity to comment on the Revised Draft 2nd Edition of the TCPS (December 2009). As with my March 2009 comments on the first draft, I offer the following comments as an American, a historian, and as a scholar who has written extensively about the history of the regulation of social science, primarily in the United States but with attention to Canada and other nations. A fundamental premise of this Policy is that research can benefit human society. In order to maximize the benefits of research, researchers must have certain freedoms. These freedoms include freedom of inquiry and the right to disseminate the results of that inquiry, freedom to challenge conventional thought and freedom from institutional censorship. Collectively, these are generally referred to as "academic freedom." Such a recognition of research as both a freedom and a right is notably absent in many comparable documents, including the famed Belmont Report. REBs should also be aware that some research, particularly in the social sciences, when conducting critical assessments of, for example, political or corporate institutions, may be legitimately critical and/or opposed to the welfare of those who are the focus of the research, and may cause them some harm. Such research should be carried out according to professional standards of the relevant discipline(s) or field(s) of research, but it should not be blocked through the use of risk-benefit analysis. In such cases, the balance of risks to those who are the focus of the research is mainly weighed against the potential benefit of new knowledge to society and the indirect benefits to the population to which the participant belongs. This is an improvement over the 2008 language which, as I noted in my earlier comments, described "harm to reputation is an unavoidable risk of certain types of social science inquiry" rather than a desired outcome of much research. Chapter 2's "Approach to REB Review" now suggests that "An assessment of [risk] may be based on the researcher’s past experience conducting such studies, or the review of existing publications that provide rates of the relevant harms in similar issues." While this is a step in the right direction, I would suggest that stronger language--that risk-assessment must be based on empirical evidence--would better guard against REBs' documented tendency toward guesswork. Finally, I m heartened by the requirement that "Institutions should support their researchers in maintaining promises of confidentiality." (Article 5.1) As Ted Palys and John Lowman of Simon Fraser University noted in their comments on the previous draft, Canadian institutions have a poor record in this regard. I am concerned, however, that the revised draft weakens protections for social scientists, scholars in the humanities, and journalists in at least four ways. First, the new draft appears to require IRB review for any photography or filming of people in public places. (Article 2.3, 10.4) This would seem to outlaw the standard practices of photojournalists, television crews, and documentary film crews. Second, the new draft weakens the protection for critical inquiry by deleting the 2008 draft's provision (Article 2.3) that "Research ethics board review is usually not required for research involving public policy issues, the writing of modern history, or literary or artistic criticism." Third, the new draft (Article 4.6) states that "Individuals or groups whose circumstances may make them especially convenient for researchers to recruit into research projects shall not be included in research solely on the basis of these convenient circumstances." Taken literally, this would seem to preclude researchers from choosing to study the communities in which they reside as a means of avoiding travel. Such choice of topics has been a staple of social science since Mayhew ventured among the London poor. My most serious concern about the new draft concerns the "Key Definitions and Principles" section of Chapter 5. The 2008 draft stated that "Privacy concerns also vary with the sensitivity of the information and the extent to which access, use or disclosure may harm an individual by exposing them to embarrassment, stigma, discrimination or other detriments." This change is of enormous potential significance, for it suggests that REBs be allowed to block projects not because they threaten to harm any identifiable individuals, but because of the much vaguer concern that they may stigmatize whole groups. Even when research does not impinge directly on it, a group may be derogated or its reputation injured. Likewise, an institution, such as a church, a university, or a prison, must be guarded against derogation, for many people may be affiliated with, or employed by, the institution, and pejorative information about it would injure their reputations and self-esteem. Scholars at Berkeley and elsewhere immediately realized that such a policy would prohibit social scientists from reporting their findings if those findings might offend anyone. After a national outcry, the policy was withdrawn. The PRE should likewise understand that forcing researchers to protect groups as well as individuals would violate the TCPS's broader commitments to academic freedom and critical inquiry. 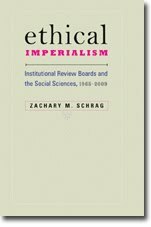 Finally, please let me reiterate my concern that this draft of the TCPS, like its predecessors, fails to answer the biggest questions surrounding the ethical review of research in the social sciences and humanities: what ethical errors do researchers in these fields commonly commit, and what structures might reduce those errors? Without substantial empirical investigation of the problems posed by research and a wide range of solutions, PRE cannot claim that ethics-board review is either necessary or sufficient to ensure ethical research. Thank you for consideration of these issues.